London’s Tower Bridge has featured prominently in many of the film and television adaptions of various Sherlock Holmes stories. Yet, it was never specifically mentioned by name in any of the 60 stories that make up the Canon. 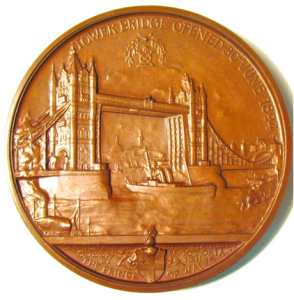 From 1832 to 1902, the Corporation of the City of London issued a series of thirty medals commemorating important events relating to the central area of London. 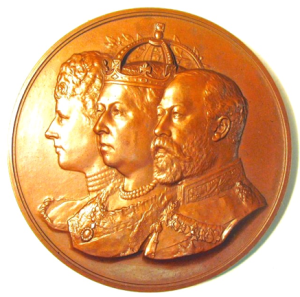 Many of these high relief bronze pieces represent the finest work of the members of the Wyon dynasty of engravers and other British and European medalists of the period. 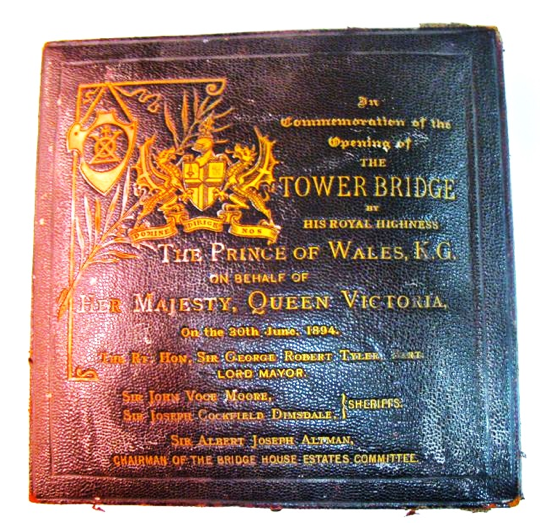 In 1894, they commissioned Frank Bowcher to design the above 77mm bronze medal to commemorate the opening of the Tower Bridge. The obverse features striking portraits of the Princess of Wales, Queen Victoria and the Prince of Wales, the future King Edward VII. The reverse features the new Tower Bridge with its drawbridges up to allow a ship to pass. 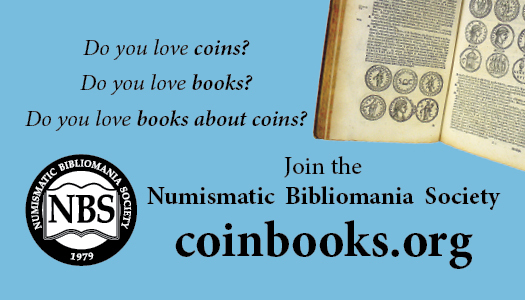 With mintages of generally less than 500 pieces, this medal series is not familiar to many collectors. Most of the medals in the series were issued in a custom leather box with the covers gold-stamped; some have explanatory text printed on the silk interior. According to noted medals dealer, Paul J. Bosco, “you haven’t lived (in a numismatic sense) until you’ve seen a Corporation of London box.” Unfortunately, the heaviness of the medals, and the ordinary ravages of time (that box above is over 120 years old, after all) have conspired against the preservation of these boxes, so that they add $50-100 or more to the value of the medal. Below, we have a clip of the start of the final fight scene between Holmes and Blackwood atop the Tower Bridge, then under construction, in the 2009 film Sherlock Holmes.